Saudi energy minister Khalid Al Falih said the kingdom’s oil output would fall by 500,000 barrels per day in December. 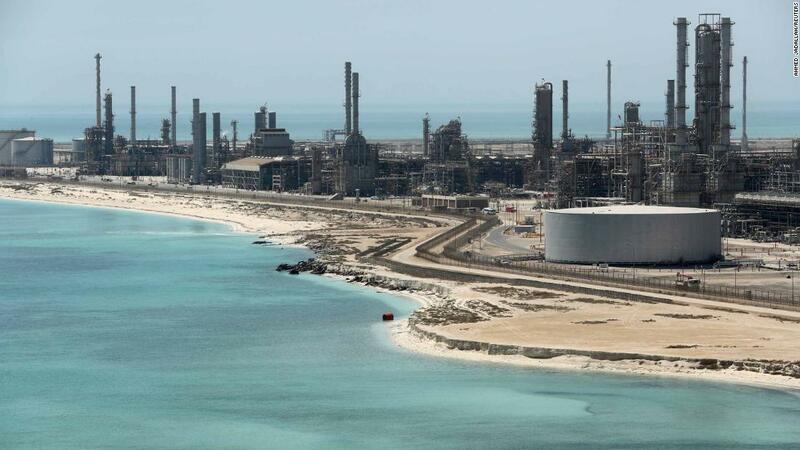 Saudi Aramco’s Ras Tanura oil refinery and oil terminal. “That probably would adjust sentiment and get [prices] back into a corridor with less volatility,” he told CNN Business. A senior OPEC source said the cartel and other major producers are discussing cutting production by as much as 1.2 million barrels per day. A decision could be taken at the next OPEC meeting in Vienna on December 6. Crude prices jumped by as much as 2% on the prospects of reduced supply from OPEC. US crude oil futures were trading around $60.80 per barrel, $1.50 higher than on Friday. The United States last week said eight jurisdictions — China, India, Italy, Greece, Japan, South Korea, Taiwan and Turkey — would be able to continue buying Iranian oil for six months without fear of US penalties under sanctions on trading with Iran. “The sanctions on Iran have turned out to be a damp squib for the time being with the Trump administration granting exemptions,” said Devesh Mamtani, head of investments and advisory at Century Financial, a brokerage firm in Dubai. “The exemptions have even surprised Saudi Arabia as oil supplies from Iran are likely to spike in the coming days,” he added. UAE energy minister Suhail Al Mazrouei, who is also OPEC president, said the cartel wouldn’t allow the market to become oversupplied. “We will assure you that when we meet in December we will go to the market with the solution that will ensure market stability,” he said.